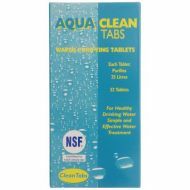 Water Purification, Cleanses water systems and tanks. Water purification is the process of removing undesirable chemicals, biological contaminants, suspended solids and gases from contaminated water. Whenever the caravan has been left standing for a few weeks, before bringing water system back into use, it needs to be cleaned using one of the proprietary makes of steriliser on the market Do as instructed carefully, but remember that certain chemicals can react adversely with metal. 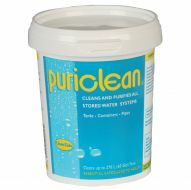 For this reason if the water goes through a Truma/Carver hot water heater for example, you ought to only use the recommended cleaner - Truma suggests Puriclean. Do not use domestic bleach. Make sure to clear away any connecting hoses and fresh water containers all at once.